Get organized and get your pads clean! Grit Guard broke new ground when they developed the Universal Pad Washer. They made it more convenient when they created the Universal Detailing Cart. Now we're wrapping it all together in a package deal that saves you money. What are you waiting for? The Grit Guard Universal Pad Washer & Detailing Cart Combo has your name all over it! Anyone that details frequently or for profit knows how inconvenient it can be to wash buffing pads. The Grit Guard Universal Pad Washer was developed to do it for you. This is the first pad washer that cleans all types of buffing pads - foam and wool - on dual action and random orbital polishers. The Grit Guard Universal Detailing Cart puts the pad washer at a comfortable height and to provide much-needed storage space on a cart that rolls where you need it. This is a great opportunity to get a pad washing station that really will make clean up faster and easier. 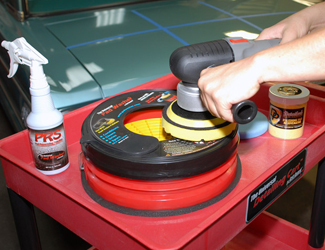 The Grit Guard Universal Pad Washer uses the power of your polisher to agitate pads. Insert the pad into the pad washer, turn on your polisher and let the grid insert clean and dry all your buffing pads.The grid insert’s large diameter allows pads of all sizes to make contact, no matter how big the orbit. Just press down and turn the polisher on at its slowest speed. The downward force pumps water upward to help clean the pad.The Grit Guard Universal Pad Washer accommodates all dual action polishers. In addition to being a large, multi-tiered, rolling cart, the Grit Guard Universal Detailing Cart is specially designed to accommodate the Grit Guard Universal Pad Washer. The cart is made of durable thermoplastic. Each shelf has raised edges to contain spills. The ball bearing, swivel casters lock in place. The cart puts the pad washer at a comfortable height. You no longer have to bend over and use it. Now your detailing products, tools, and pad washer are all within easy reach while you work. The dimensions are 29 x 20 x 16 inches. 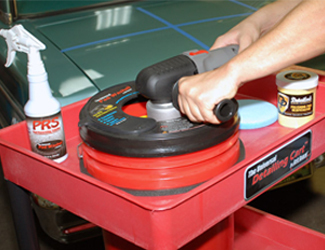 If you are in search of a convenient and efficient way to clean buffing pads – no matter what kind of polisher you have – the Grit Guard Universal Pad Washer & Detailing Cart Combo is exactly what you’ve been looking for. A total retail value of $304.98. Save $14.99! This item ships via ground service. Due to the size of the shipment an additional $30 Shipping Cost has been added. Expedited and international shipping are not available. Additional discounts are not applicable. Griots Polishers & KitsFLEX Polishers FREE SHIPPING!RUPES Polishers FREE SHIPPING!Cyclo Orbital Polisher & AccessoriesMakita Buffers & PolishersPorter Cable 7424 XP Dual Action Orbital Polisher & AccessoriesDewalt Polishers & BuffersCircular - Rotary Polishers & AccessoriesFLEX XFE15 150 Cordless Orbital PolisherFLEX PE-150 Cordless Rotary PolisherFLEX XFE15 150 Cordless Orbital Polisher - TOOL ONLY!FLEX PE-150 Cordless Rotary Polisher - TOOL ONLY!Flex XC 3401 VRG Dual Action Orbital Polisher Free Bonus!Meguiars MT300 Dual Action PolisherRUPES BigFoot LHR15 Mark III Random Orbital PolisherRUPES BigFoot LHR21 MARK III Random OrbitalRupes LHR 15ES Big Foot Random Orbital Polisher FREE SHIPPING!Rupes LHR 21ES Big Foot Random Orbital PolisherRupes LHR 75E Mini Random Orbital Polisher FREE SHIPPING!Rupes LHR 12E Duetto Random Orbital Polisher FREE SHIPPING!Rupes Bigfoot Nano iBrid Short Neck Kit FREE SHIPPING!